The Black Cat is a character in the Game Boy Advance game Wario Land 4. She acts as Wario's enigmatic guide throughout the game. The Black Cat's true form is Princess Shokora of the Golden Pyramid, who once ruled the area. The evil, power-hungry, money crazed Golden Diva put a curse on Princess Shokora, transforming her into a Black Cat and banishing her from the Pyramid. She soon came across a city inhabited by modern humans. There, she lived on the streets with a group of stray animals. Many months later, the Pyramid was discovered by a group of archaeologists. Many undisclosed occurrences caused all future investigations of the Pyramid to be canceled. A newspaper article was published. In the game's introduction, the Black Cat was crossing a street whilst Wario speeds towards her in his Wario Car. Frightened, she covers her eyes with her paws, and the car's wheels narrowly miss her. A newspaper flies into her face. It reads "Pyramid discovered deep in jungle. Legendary Treasure nearly found, but accidents hindered findings." She journeys out of the city, through a desert, and deep into a jungle. She gets to the Pyramid before Wario (who has no knowledge of the Black Cat's true form), and guides him to the main room. Wario makes his way through the Pyramid's Passages, ridding the Pyramid of it's evil, and eventually entering the Golden Diva's stronghold. Wario faces the challenge in the hope of a large amount of Treasure at the end of it all. When Wario and the Black Cat face the Golden Diva, the feline makes the first move by scratching the Diva's face. It has little effect, and the Diva swallows her whole. 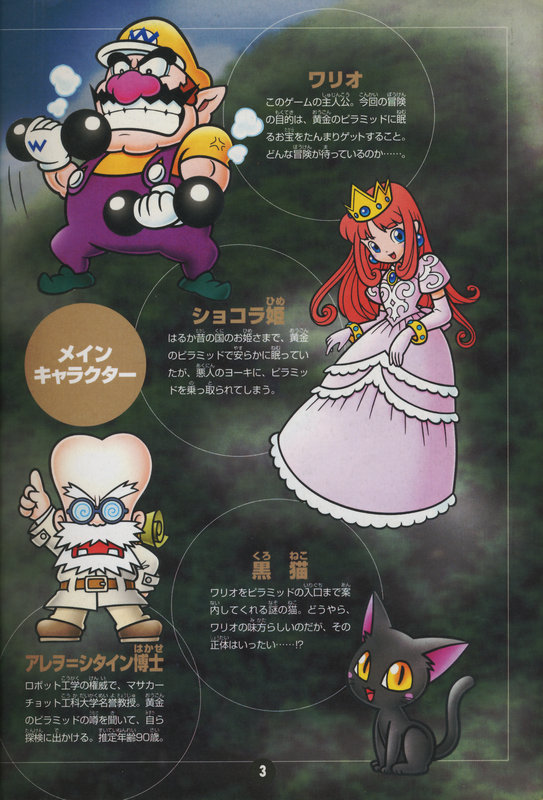 Wario challenges the Golden Diva to a battle and when Wario defeats her, she will spit out the Black Cat. The internal structure of the Pyramid begins to crumble. With the Cat warning Wario to escape quickly, he gathers up as much treasure as he can (including the Golden Diva's Jewelry). With the Black Cat leading the way out, they escape the Pyramid before it crumbles on top of them. When they are at a safe distance, they watch the Pyramid fall to the ground. With the Cat quite content about the defeat of the Golden Diva, and Wario satisfied with his haul of Treasure, they laugh. But suddenly, the Black Cat undergoes a transformation and turns into Princess Shokora, true ruler of the Pyramid. The crown, earrings, necklace and bracelets that Wario swiped from the Golden Diva return to their rightful owner. Wario cannot believe his eyes, with such a beautiful being standing before him. The Princess kisses Wario on the cheek and says, "Thank you, Wario...♥" With a wave of farewell, four angels surround her and lift her into heaven. Wario just sits there, trying to make sense of it all. He soon dismisses it, and picks up the sack of remaining Treasure, and drives back home. The ending cut scene is very similar to the opening one, except a white cat crosses the road this time. The newspaper that blows into this Cat's face is advertising a restaurant and it reads, "Steaks! Eat as much as you can!!". Princess Shokora with the Black Cat. The Black Cat as seen in the introduction sequence. Idle, as seen during in-game sequences. Movement, as seen during in-game sequences. Black and white cat sprites. The Black Cat almost getting run over in the opening cut-scene. The Black Cat with a stray dog seen in the game's opening cut-scene. The newspaper seen in the opening cut-scene, with the Black Cat's shadow. The Black Cat challenging the Golden Diva. Wario and the Black Cat recovering the Legendary Treasure. Wario and the Black Cat escaping from the Golden Pyramid. The white cat seen in the game's ending cut-scene. The Black Cat can be seen in the rooms before the boss entering the Item Shop. But when Wario enters the Shop, the only other being there is the Item Shopkeeper. If Wario purchases an item before facing the Golden Diva, after the item's use concludes, the shopkeeper will transform into the Black Cat. This suggests that the Black Cat has an additional form as the Item Shopkeeper. ↑ Wario Land 4 official Shogakukan Japanese guide, page 3Media:Japanese Green Guide Page 3 - Wario Land 4.png. This page was last edited on February 15, 2018, at 13:26.